Forget about sub-$100 smartphones, there’s now a sub $50 smartphone (including worldwide shipping), some kind of mini Galaxy S3 clone with a 3.5″ touchscreen, powered by Speadtrum SC6820 Cortex A5 + Mali-400 SoC, with 256 MB RAM, 256 MB ROM and running Android 4.0.3 (ICS). Camera – 0.3MP front camera & 1.3MP rear camera. The package includes the phone, two 1800mAH batteries, a 100-240V charger, headphones, a USB Cable, and a user manual in English. For this price, the specs look pretty amazing… Of course, you can’t expect great performance from this phone, and with 256MB RAM, many apps may not run smoothly or at all. I’m not even sure if we can expect Google Play Store in that device, and as usual, there may be errors (or lies) in the specs, so you’d better ask confirmation in the store if one of the feature is important to you. 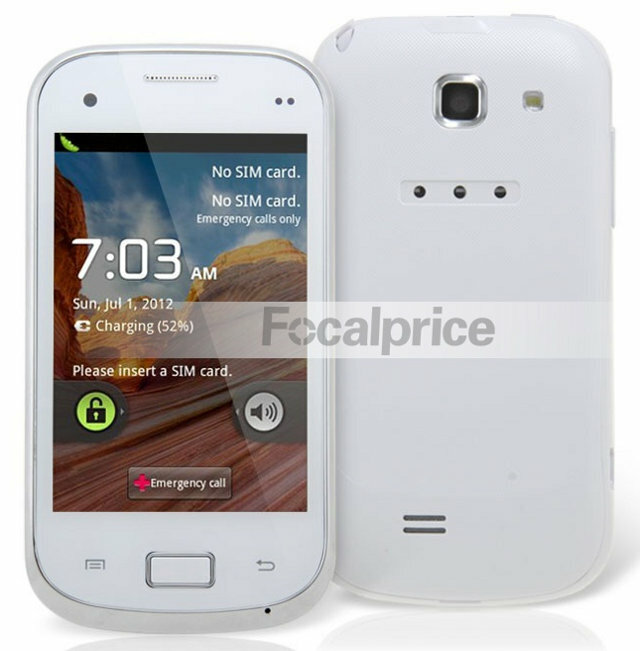 Yet for $50, it could be the cheapest android 4.0 smartphone, and could be an option for a kid’s phone. If you want to see how it performs, there’s a video of a smartphone based on Spectrum SC6820 SoC. Please note that it might not be exactly the one described above, but this is based on the same platform. It’s the first time I’ve read about Spreadtrum SC6820, so I’ll give some details about this processor. SC6820 is a 40nm CMOS chipset that integrates a Cortex A5 core, a Mali-400 GPU, and an EDGE/GSM/GPRS accelerator. There’s also a multimedia sub-system that can decode MPEG4/H.263 (720p@30fps), H.264 (WVGA@30fps) & VP8 (WVGA@30fps) and encode H.263/H.264/MPEG4 (WVGA@30fps). The SoC supports a maximum of 1GB RAM and 4GB Flash. Spreadtrum provides Android 2.3 and 4.0 support for the platform. You can find more information on Spreadtrum SC6820 page. Thanks to onebir for the tip!